Trance map est un espace de densités, de matieres sonores abruptes, de cubes synthetiques, une ligne insistante traversant les temporalités, une immersion dans une trance qui se trame, une musique qui emporte, ailleurs, Toma. 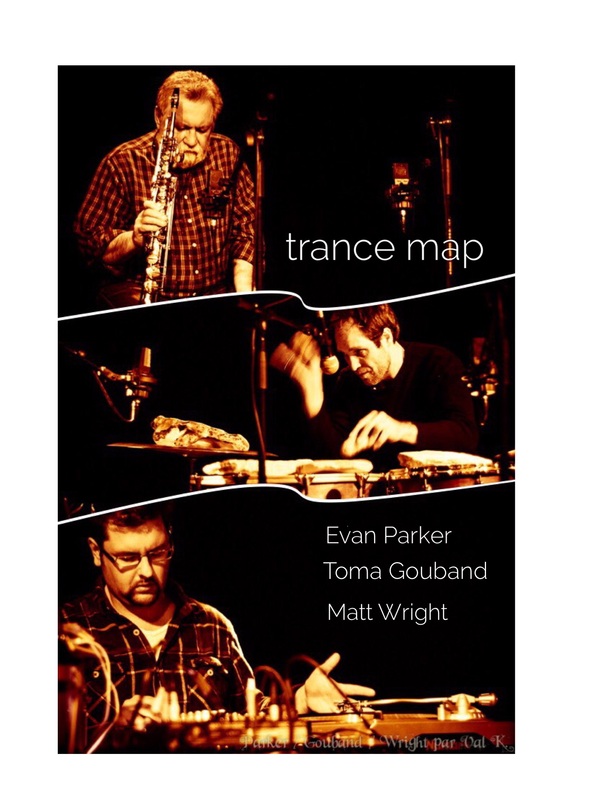 Trance Map is originally Matt and Evan ‘s collaboration, in a game of reflections with electronic and acoustic, an exploration of a territory out of time. Concerts are usually quite long, in order to take time to loose time and discover. 2 cds are available : Trance Map (Psi 2012) and live at Instants Chavirés (Hubberfield 2014) . Trance Map – Live @ Instants Chavirés, Montreuil, France from Igor Juget on Vimeo. Despite being indexed as four separate tracks, this is one continuous piece of music that lasts over 68 minutes. The introductory section consists of small sounds that could be samples of insect noises or their electronically-generated equivalent. Slowly, an electronic drone increases in intensity from nothing, gradually revealing previously unheard textures and details, including the unmistakable sound of Parker’s sax. The main body of the piece persists for over an hour; initially, it is intermittently punctuated by a pulsing low frequency throb that adds an air of menace to the soundscape. Other than this, its characteristic sounds are Parker’s soprano saxophone, surrounded by all manner of bird and insect sounds, real and electronic. The overall effect is of Parker playing in a swarming tropical jungle clearing. Trance Map is well-named. When Anthony Braxton named one phase of his compositions “Ghost Trance Music,” the justifiable question was, “Where is the trance?” No such indignant query is necessary with this music. As Parker points out in his sleeve notes, it is multipurpose, depending on the volume at which it is played back. At normal volume it is over-brimming with aural information, much of it operating at a subliminal level. As such, it richly repays repeated listening and intense concentration being invested in it. At a much lower volume—perhaps late at night, on headphones—it is music designed to fall asleep to. Or even to induce a trance-like state. Either way, it is mesmerizingly beautiful.